I wish shuki will go upload tut vids on his channel again:D Merry christmas, everyone! This topic started nearly six years ago, my goodness how things don't usually go according to plan...The book is pretty much complete on my part, but final editing and publishing means it will still be released sometime in December. Here is the original list of models which I thought I would include. And of those only 6 ended up making it into the book plus 10 projects which were almost all designed after the date this topic started. of course another 5 models in the original list were diagrammed and published elsewhere. I nearly added the Atlas Beetle, but the base seemed too similar to the Kabutomushi which was published in Tanteidan 21. So, this is finally happening! I did consider it, updating the diagrams to the western dragon and spinosaurus for the book. But they are already widely available, so I decided against it. As I'm sure most of you all know, the giraffe and African Elephant are in the book despite the fact those diagrams were already released for a price online. That is because the actual book deal didn't come through until after I published them on my Etsy and OUSA. I would have saved them for the book alone if I had known about all this beforehand. Nevertheless, I have upgraded both diagrams by redrawing almost every arrow and by adding more in-progress-steps. Congratulations on finishing it! I'm glad to see that the goldfish model is included in the book because I'm a total sucker for origami fish models. I'm looking forward to purchasing the book. Didn't Shuki Kato release a series of Origami Christmas books..?? 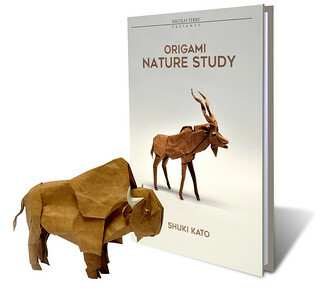 Andre-4 wrote: Didn't Shuki Kato release a series of Origami Christmas books..?? No. He contributed to the Annual Christmas Book on the forum. You have to submit a original, diagrammed model to receive the book. Well, the book is finally available for preorder, it only took me 6 years to make dating back to the first entry in this forum. 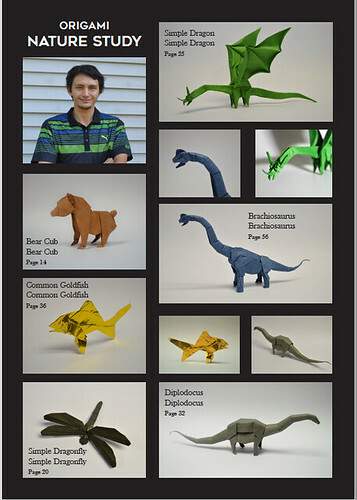 On a more serious note, here is a picture of the cover and the individual models. I want to fold them all! Which one should I fold after I finish the simple dragon? raden_pak_1217 wrote: I want to fold them all! Which one should I fold after I finish the simple dragon? 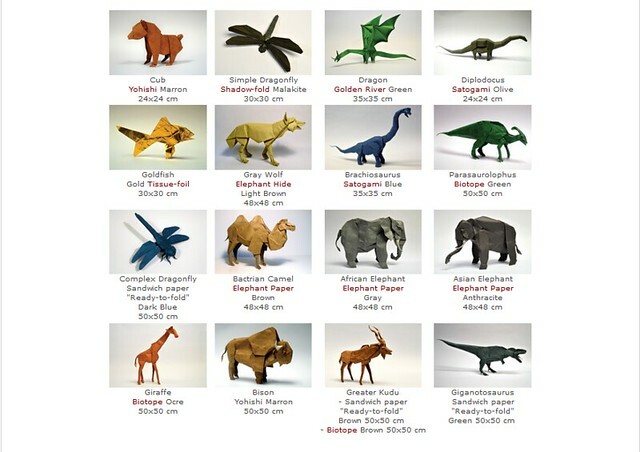 Here is the order I would go: Diplodocus, Bear cub, wolf, goldfish, simple dragon. They are still difficult, good models to get you associated with Shuki's design style. As in lots of awkward sinks, closed sinks, and generally difficult or multi-step procedures. 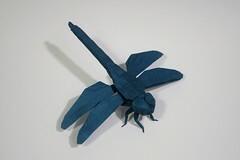 The dragonflies are just boxpleating, but you could throw them in there too for some more practice. Once you complete all those I would move onto some of the more complicated ones, like the dinosaurs or super complex animals. 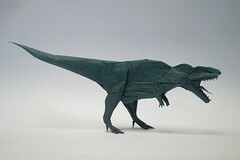 I'm making the camel right now, and it is a pleasure to fold! With all that talk about profit at the start of this thread, I'm wondering, have you made any profit or loss off the book yet? Folderp wrote: With all that talk about profit at the start of this thread, I'm wondering, have you made any profit or loss off the book yet? I've been able to make about $5000 off of it, nothing crazy though considering how much effort was spent!